Review: "Sieges Even: The Art of Navigating by the Stars" - Sea of Tranquility - The Web Destination for Progressive Music! The last time Sieges Even released something was in 1997. After the Uneven album, the band took a break, and the band members focused on different musical projects or had brief stints with other bands like Paradox and Blind Guardian. Back in 2000, however, the core lineup of Sieges Even reformed under the Val'Paraiso moniker without a vocalist. They cut two demos but what they produced seemed to reek heavily of the trademark Sieges Even sound, so the band reformed and began to seek a fitting vocalist. Enter Dutch singer Arno Menses, originally a drummer in the Netherlands, but his role in Sieges Even is completely fixed in the vocal department. Menses' vocal style has certainly injected new life into the band, as he is far from a hired gun brought in just to sing the lyrics. He seems to have taken a huge role in the songwriting process, defining the melodious edge of the band. The new songs encompass plenty of choruses packed with a passionate and soulful vocal delivery. The Art of Navigating by the Stars is a long-form composition divided into eight movements, plus a short intro track. These movements, or sequences as they are named in the booklet, are all parts of a huge 63-minute song, linked through various key themes and motifs. A bit like Fates Warning's A Pleasant Shade of Gray in this respect, the songs use common motifs, best noticed on "The Weight", "Stigmata", and "Styx". The same melody line "The view from here is frightening" is repeated in each song together with Oliver Holzwarth's articulate bass riff, tying them together and lending the album a sense of unity. The writing is very cohesive throughout, utilising an array of influences that venture into both 7-string and classical guitar from Markus Steffen, who also boldly explores jazz and fusion category. His playing is no where near as busy as the older Sieges Even material, however. He is more focused on a song-oriented approach, and tries to escape any extended interplay that might have rendered the tracks meaningless. Still, there are several instrumental sections on the album executed with perfect harmony between the Holzwarth brothers and Steffen. "Unbreakable" is one of the strongest numbers for its progressive and innovative nature. After a midtempo start that is built around acoustic guitars and furious bass, there is a smooth instrumental breakdown where Alex Holzwarth's cymbal work is at its shining best and Markus Steffen's improvised jazz solo is intense. Arno Menses' vocal layering completes the track with an emotionally exhausting performance that reaches into the depths of the soul. "The Weight", the longest song with 10 minutes, is also the heaviest. The dynamics of this song are flawless and the production is easily the best in Sieges Even's entire back catalog. Oliver Holzwarth proves to be one of the most underrated yet technical bassists in Germany, producing swift shifts between heavy and mellow melodies that allow Arno Menses to come up with staggering vocal harmonies. The chorus of "Stigmata" is utterly infectious, filled with a rich harmony layered on top of Steffen's continuous guitar theme, which is repeated over and over until the listener is immersed in its plaintive churning. The song, however, reaches its apex when the recurring theme resurfaces at the end with Menses' amazing singing. Again, originally a song from the Val'Paraiso demo, "The Lonely Views of Condors" follows a similar pattern. Atmosphere is generated by the melodic quality of Steffen's guitar riffs and textural melodies that do a great job without the need for a keyboard player. This song is loaded with a fantastic chorus that resolves the dense mood and lets Menses express himself with a masterful vocal melody at the very end. Those interested in Alex Lifeson meets Allan Holdsworth type of guitar playing will be pleased when they hear the classical guitar theme on "Blue Wide Open" or the fusion solo on "To Those Who Have Failed". Markus Steffen is an incredible songwriter with immense feel and invaluable dexterity. Surely this has been one of the most anticipated comeback albums of the year, and it has more than fulfilled its aim. Sieges Even are no longer the ultra-technical prog metal act squeezing as many notes as possible in every song, and therefore may surprise some of their older fanbase. However, they have returned with an equally innovative piece of work and their best vocalist in their entire career. With a move to Inside Out, the future should only bring them more exposure and luck. It does take several spins for the music to grow on you, but it is definitely worth the effort. 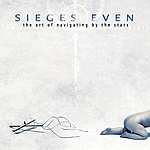 Fans of Sieges Even will no doubt be surprised at how different the band sounds on their return to the prog world with the new album on InsideOut titled The Art of Navigation By the Stars. While the bands earlier albums centered on a sound that was highly technical and at times crushingly heavy (comparisons to Rush, Watchtower, and Cynic seemed to follow the band), this latest release is extremely melodic and atmospheric, and while it does have moments of technical virtuosity and metal arrangements, this is very spacious, imaginative, and vocally strong progressive rock that has plenty of color and depth. Yes, you heard me right, this CD is vocally very strong. The majority of the Sieges Even back catalog always had one major problem, and that was that the various singers the band had could never match up with the talents of the musicians. New vocalist Arno Menses has catapulted this band to new heights, and his powerful and melodic vocals and lyrics have given Sieges Even that extra edge that prevented their early material from having accessibility to anyone other than technical progressive metal fans. The music on The Art of Navigating By the Stars breathes, it flows, it has moments of gentle beauty, as well as moments of intricate experimentalism. Never ponderous or flashy for chops sake, this CD has moments of gorgeous majesty, like on "Sequence II: The Lonely Views of Condors", where the multi-layered guitar chords, rippling bass, restrained percussion, and the soaring vocals of Menses work melodic wonders together. If you adored the bands technical side, there's still plenty of amazing passages here to savor, like the amazing interplay on "Sequence I: The Weight" and the symphonic fusion feel of "Sequence VIII: Styx". Brothers Alex and Oliver Holzwarth still know how to lock into an intricate and melodic groove on bass and drums, and guitarist Markus Steffen is just an incredible player, as he more than covers for another guitarist as well as a keyboard player. His many layers and tonal colors gives Sieges Even a much fuller sound than most four & five piece bands have. Basically, this is an album that needs to be heard by any fan of contemorary progressive rock. The melodies and musical arrangements are simply irresistible, and the listener can easily get swept away by the magical sounds on this CD. If you've never given Sieges Even a chance based on their earlier material, give this a chance as they sound like a totally different band, and this release is easily one of 2005's biggest surprises and will easily be on many top picks for the year. This is simply one of the best albums I ever heard. Less technical than "A Sense Of Change" but with a lot more emotion. Every self respecting rock freak should own this album.